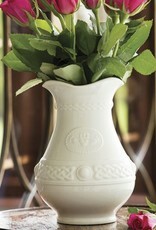 This beautiful Claddagh vase makes a wonderful centerpiece and is a nice place to display some flower bunches. It features gentle scalloping detail at the top and a rounded shape at the bottom. It measures approx 8”H x 4.25”W. Look for matching Claddagh Collection pieces. 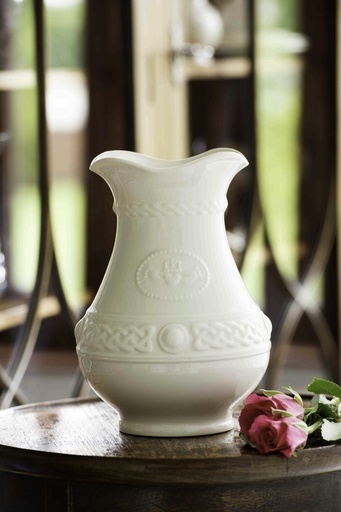 The Belleek Claddagh Collection, inspired by the Irish Claddagh ring, is simple and elegant in design. 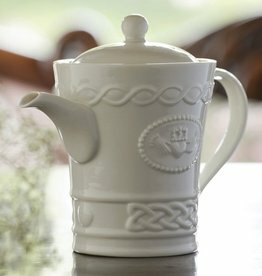 Clean lines of the fine china, paired with embossed details of Celtic knot work and the Claddagh, a symbol of Love, Loyalty & Friendship. It is a collection that makes a great gift for engagements, weddings or any special occasion. Belleek is handcrafted in Ireland of fine Parian China. Item comes boxed. 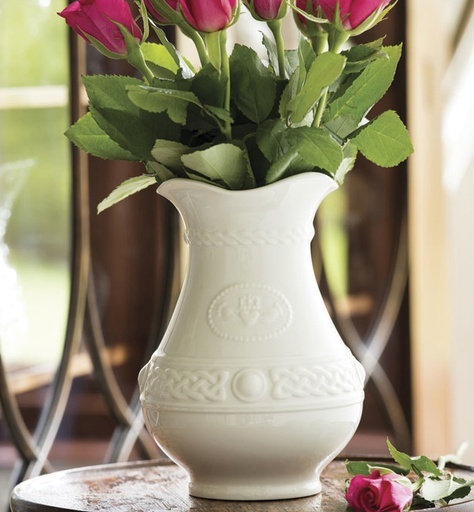 Pair this beautiful Claddagh beverage pot with the matching sugar bowl and creamer to make a drink shared with friends or a loved one just that much more special. It measures approx 6.25”H x 7.5”W. Look for matching Claddagh Collection pieces. 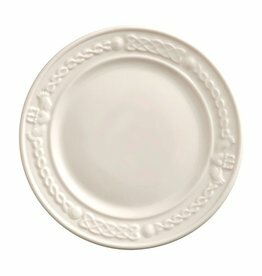 The Claddagh side plate is the perfect little dish to serve up a yummy salad or delicious dessert. It is part of a wider dinnerware collection. It measures approx 7.5” across. Look for matching Claddagh Collection pieces. 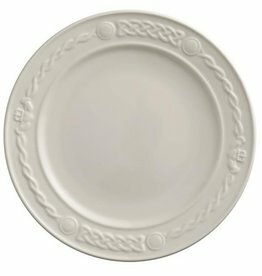 Class up a meal, any time of year with this beautiful Claddagh dinner plate. It looks elegant enough for a fancy party but also may be used to serve a family dinner any night of the week. It is part of a wider dinnerware collection. It measures approx 11. 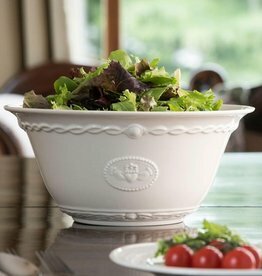 This large, Claddagh serving bowl makes an excellent addition to your Irish kitchen. It has more than enough room to serve up your favorite side dishes. It measures approx 4.5”H x 10”W. Look for matching Claddagh Collection pieces. 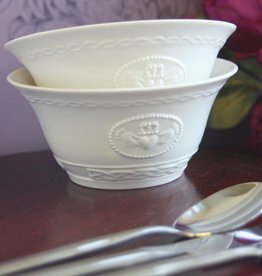 These beautiful Claddagh bowls are just perfect for serving up some Irish oatmeal or a hearty stew. Each bowl measures approx 2.75”H x 6”W. Sold as a set of 2. Look for matching Claddagh Collection pieces. 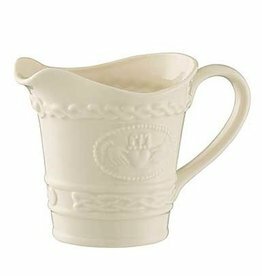 Pair this beautiful Claddagh creamer with the matching sugar bowl and beverage pot to make a drink shared with friends or a loved one just that much more special. It measures approx 3.75”H x 5”W. Look for matching Claddagh Collection pieces. This beautiful Claddagh frame will display a treasured photo in elegant style. It stands on it’s own with a folding stand at the back. The frame measures approx 10.5”H x 7.25”W and holds a 5”x7” vertical photograph. 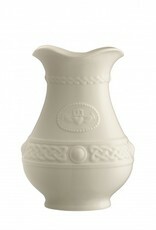 Look for matching Belleek pieces.